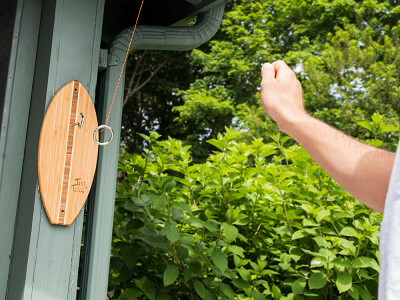 Tiki Toss is an easy-to-play (and extremely addictive) hook and ring game. It will be a hit with lovers of classic party games like corn hole or ladder toss. According to our research, the original hook and ring game could have originated in Robin Hood’s time. Or maybe it was invented by Hemingway. But the Tiki Toss version we discovered actually started as a smartphone game. Developer Kyle McGetrick wanted to create a simple time-killing app. Before long, Tiki Toss caught on—so much so that fans started asking Kyle to create a physical version. Your goal is to “catch on” too. 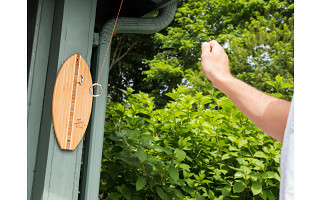 Set up the Tiki Toss board, swing the ring on a string and try to hook it on the board. Start with the ring closer or farther to vary the degree of difficulty. 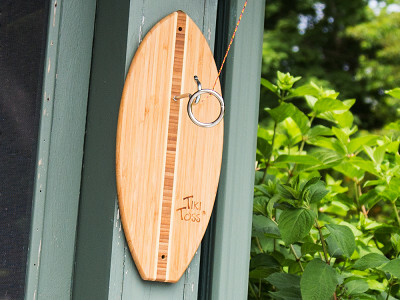 The board doubles as décor, available in beautiful, 100% bamboo shapes. 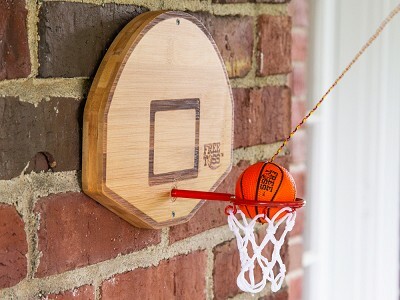 Set up on a tree in your backyard, an outdoor wall, or even on a rec room wall for indoor play. It’s one way to keep your next party swinging. Hello everyone! I'm proud to introduce the Tiki Toss The Grommet. I'd be happy to answer any questions you have! "Hooking up. Swinging. This party game has it all..."
Hi Tonya, it certainly was not meant as such, but thanks for the feedback. We tried to have a little fun with the email line to try and match the fun you can have playing Tiki Toss! Looks like fun but not worth $29.95. @Diane Tiki Toss is crafted out of 100% bamboo and the components are designed and made to compliment the game. Hooks have minimal thread. The rings are made with a pass through for the paracord for ease of adjustment and design aesthetic. I could see a cheaper price point for a lower quality, plastic or plywood version, with components out of the hardware store. But we take too much pride in our materials, design and the high quality standard of our products to release such a version. But you're right, Tiki Toss is a lot of fun! @Kyle It's still not worth $30. Preach about the quality all you want, but it's still just a hook and a ring and a board and a string. In a DIY era, does the market really want to spend $30 for something they can get for $19.99 at Menards (same exact product) or even less for just the hardware? Hi Mike, this is where the choice you have as a consumer comes in. Some, like yourself, may not be able to rationalize the price and would rather get it somewhere else. Others, like Lisa down below, see the value in helping a small business grow as justification. @Mike, I can see your point. Actually, I felt the same way and that's why we initially launched an iphone app for Tiki Toss. When fans began to demand a physical version of the game, I pointed them to the hardware store and even provided directions on how to make one. As the demand grew, however, we decided to give it a try. When we first launched the product, at Surf Expo, I expected that exact response: I can just make one.. Instead, however, the feedback was the opposite. at least 20 times, I heard some version of, "I've been meaning to build one of these for years, but here it is in a package! How much is it?" Not to mention the endless compliments on design aesthetic and quality. Funny, but the product only came to fruition through direct consumer demand.. And 5 years and hundreds of thousands of units later, I'm very happy that I listened! Can you tell us where your product is made? Great idea. I have seen a modified version at our favorite restaurant T-Bone Tom's in Kemah, TX. It wasn't as attractive as your version, but kept the kids busy while we waited to be seated for dinner. Simple concept, but the kids loved it. @J Our Bamboo is sourced in China and therefore the product is fully assembled there. We work with an amazing source that harvests the bamboo per our orders and then replants the highly renewable crop. @Kyle I commend you for choosing an earth friendly material in your product as bamboo is a green sustainable material. This is an attractive product that looks fun, but you unfortunately lost me at Made in China. There are several bamboo farms in the US that could be used as a source, but I realize that taking the production in house would probably make this a handmade product and add to the overall cost. A handmade in USA with USA materials product would justify a higher price point to me. Good luck, it is a great idea. @JOE I completely respect your position and respect products that are made in the USA and the companies that are able to achieve US based production. It's interesting. When we started manufacturing this product in 2010, I was determined to have it manufactured or at least assembled in USA. We went through great pains to achieve this. We accepted to taking a smaller margin and maintaining an acceptable retail price point. Funny enough, it was quality that was became the issue. We worked at it for over a year, with 2 different factories and encountered one problem after another. I could list the issues that we had concerning communication, consistency, print quality, shipping and logistics issues etc. It was to the point that we were almost out of business due to quality issues when we had to make a change. Luckily, we have a great source and relationship in China and our products are consistent in quality that we can stand behind and our orders are always delivered on time. I'm not sure this is what you wanted to hear, but a true story. Thanks so much for the peek behind the curtain, Kyle! Your story is akin to so many other Makers who certainly want to manufacture in the US, but end up running into a road block in some way or another. It really gets to the heart of why we think the Maker Movement is so important. As it gains more steam, the obstacles you and other Makers face in manufacturing domestically are ideally removed. Regardless, this product is fantastic, it's wonderful to hear you have a great relationship with your manufacturer, and I'm sure as you continue to grow you will look for that accessible entry point into US manufacturing. Thanks for the feedback @Mike. I've talked to many manufacturers with similar stories as well. And yes, our eyes we are keeping an eye open for that entry point. 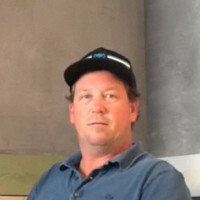 Hi Kyle, I love surf stuff and games that are fun but a bit challenging and made for all ages. Just a quick question before I buy. Is the string already attached to the ring out of the box? Is the string stretchy at all? Can the length of the string be adjusted? Thanks for your help, and I always appreciate someone who actually take an idea all the way to market. Yes it is a DIYer project but I would much rather buy and support a small business. Thanks @Lisa. The string is attached to the ring out of the box by of passing through a hole in the ring. The string can stretch over time and is easily adjusted by tying a knot in the string on the under side of the ring. I hope that answers your questions! Wow, a new spin on a 18th century game called Ringmaster started by pirates and yes perfected by Hemingway at the Complete Angler Bar in Bimini until it burnt down. I've been there and played on the very same game. I now own my own in my bar. Which I built for $8 and some scrap wood. Best of luck with your version, only wished I rebranded a version for my self. This looks like something I can do with a cold drink in my hand. My kind of game! Bought 2 of them-One for me- one to give as a gift. Many of the responses here have not been kind or helpful. No need to skewer the entrepreneur with hate, if you think this game is something you wish to purchase, buy it. If you think it is not acceptable because of country of manufacture, price, or whatever else, don't buy it, but be nice. I feel that we need to applaud the spirit with which one follows through by bringing an idea to market. Let's celebrate the maker community and encourage the entrepreneurial spirit. And after that comment, Janet, I feel that we need to applaud you! Beautifully said! Thanks for your support and your kind words @Janet! I love this game! I bought 1 for myself and several for friends and neighbors. It's quite addicting however, so be careful! I'm embarrassed to say that my personal best score has been only 5 in a row, after that, I choke. Personal best anyone? Thanks for putting this out there Kyle. Having learned of it's connection to "Pirates," I'll have to throw a pirate party...Arrrrrrrr! Thanks for the kind words, Tom! Five in a row sounds pretty good. Are you playing with professionals who are posting double digits? @Tom I have you beat, but only by 3 (and I don't play as well under pressure), so we'd probably be a good competitive match. My friend Chanda, who works with me at Surf Expo every year has gotten 13 in a row, twice! That's the best I've personally seen..
Love this game! We've played it at the bar and every time my husband says "I need to make one of these." Well several years later we still don't have one! I think $30 is absolutely reasonable for this product. Yes I'm sure you can get the materials cheaper, but your time and effort to make it are worth something, too, and personally I think $30 is a steal when you factor that in! Definitely buying this! Thanks for the kind words, Laura! We agree and hope you and your husband enjoy!